Irene Leon, advisor to the Ecuadorian foreign minister addresses members of three different Oneida clan families. ONEIDA OF THE THAMES TERRITORY – On Sunday, October 25, a 10 person delegation headed by Irene Leon, advisor to the Ecuadorian foreign minister, was welcomed at the Kayanere’ko:wa longhouse within the K^onthyokwanhasta on Elijah Rd, on Oneida Nation territory. This gathering was the latest step in the development of an ongoing relationship between three traditional Oneida Nation clan families who follow the Kayanere’ko:wa (the Great Peace), and the movement known as the Bolivarian Alternative for the Americas (ALBA). Sunday’s delegation was received by some 35 members of the Turtle, Wolf and Bear clans, including Hoyane (chiefs) and clan mothers. The delegation from Ecuador included representatives from Alliance Pais, the coalition of social movements backing the current Ecudorian government as well as long time Chilean activists. The main purpose of the delegation was to strengthen an ongoing relationship with traditional Onkwehon:we clan families that has been building since early April of last year. On April 8, 2015, a delegation of some 30 members from the Latin American community in Toronto accompanied Wilmer Barrentios, the Venezuelan ambassador to Canada for a meeting at the Kanien’kehà:ka (Mohawk) long house at Six Nations of the Grand River Territory. At that meeting, diplomatic protocols were observed and lines of communication were opened between the Venezuelan government and clan families represented within the K^onthyokwanhasta or peoples wampum. [The complete transcript of the diplomatic exchange from that visit is available online via the Two Row Times newspaper. The audio of the speech made by Venezuelan Ambassador Barrentios event, and the speech given in reply by Kanenhariyo on behalf of the Mohawk Longhouse are both available via the What’s Going On? Podcast. For more information about the K^onthyokwanhasta, check out Episode 9 of the What’s Going On Podcast. Following the ambassador’s visit, representatives from the Ecuadorian government who had joined the delegation of April 8, continued to develop relations with the clan families involved in the K^onthyokwanhasta movement. The Ecuadorian consulate in Toronto reached out to members of the K^onthyokwanhasta in Oneida and Six Nations and Akwesasne, and asked for their help in coming to Washington on April 19th and 20th to stand together with the people affected by the ecologically destructive acts of Chevron. In answering this call for help, over 100 traditional Onkwehon:we people from Oneida, Grand River, Tyendinaga, and Akwesasne drove to Washington for a rally outside the offices of the world bank in order to support the indigenous peoples of Ecuador and their $10 billion dollar lawsuit against oil giant Chevron for its pollution of the Amazon – an ecological disaster ranked as one of the greatest in human history. 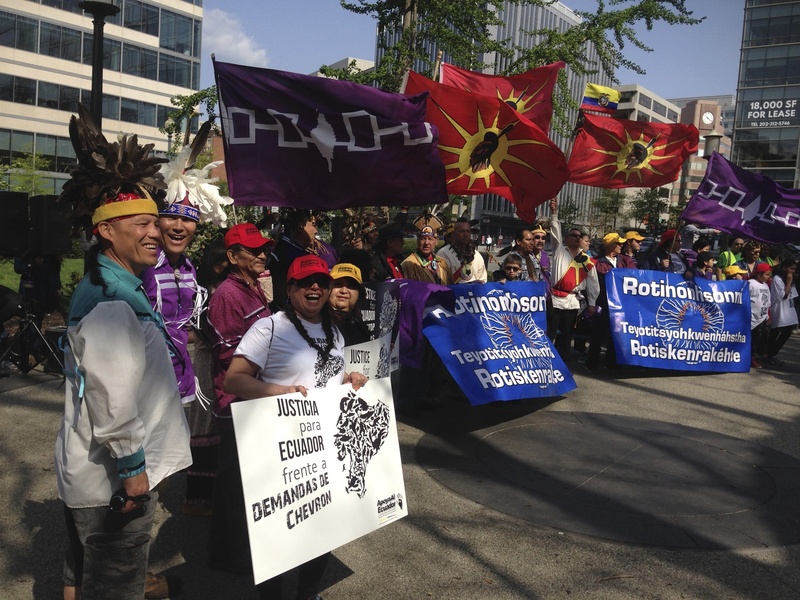 Rotiskenrakehte gather outside of the World Bank headquarters in Washington DC in April of 2015. The participation of the Onkwehonweh delegation was enthusiastically welcomed by the thousands of Ecuadorians present at the Washington rally, and the intervention in support of their southern cousins, was widely reported and made front page news in the daily papers in Ecuador. Follow-up meetings were held with Ecuadorian representatives after the event, and Kanasaraken from the Bear Clan of the Akwesasne Mohawks was sent to Ecuador as a representative of the K^onthyokwanhasta for a meeting and a series of workshops concerning the anti-Chevron campaign. This campaign, which has trended on Twitter with the hashtag #chevronsdirtyhand, has seen the Latin American community in Canada build relationships with Onkwehon:we people as well as with anti pipeline movements such as the Unist’ot’en camp in BC which stand in the way of a major tar sands pipeline backed by Chevron. The gathering at the Oneida longhouse on Sunday, October 25, thus represented a continuation of this ongoing relationship. In addition to bringing a message of greeting and solidarity from the Ecuadorian social movements, Ecuadorian representative Irene Leon made a formal invitation to the three clan families who were present to send a delegation to the global indigenous summit that the Bolivarian movement is planning in June 2016. At this conference, the presidents of 10 different Latin American nations will be present to meet with representatives of indigenous peoples from across the Americas. The aim is to bring together indigenous peoples movements across the Americas with the ALBA governments to address common problems and to build an international alliance of social movements and indigenous peoples. The conference is set to occur during the course of the summer equinox from June 19-21, 2016 and will be held in Ecuador. Sunday’s meeting was an indication that the rebuilding of traditional Onkwehon:we ways of governance is alive and well. The meeting was opened with the traditional Thanksgiving address, and the visitors were informed that they were being welcomed on behalf of not only the ancestors, the elders, the men and women, and the children, but also the faces yet to come – the people in whose interests all decisions must be made. The Ecuadorian delegation and the K^onthyokwanhasta sat on opposite sides of the Longhouse and counseled amongst each other in coming to decisions which were expressed to the other side of the fire by their speakers. Both groups expressed satisfaction that their ongoing relationship was being strengthened by regular contact and discussion together. Regarding the invitation to the International conference in June 2016, the Oneida clan families decided that further discussion was required before making a formal decision about attending the conference. They informed the Ecuadorian delegation that they would return a formal answer to them once they had fully consulted with their people. The Ecuadorian delegation provided their hosts with gifts including a coffee table photo book which showed pictures of the environmental devastation caused by Chevron and also provided a glimpse into the lives of indigenous peoples in Ecuador and the stunning landscape and natural environment that is their home. Chilean members of the delegation performed a song about the struggles of the Mapuche peoples, and presented the longhouse with a portrait engraved in copper of socialist president Salvador Allende who was murdered in a CIA sponsored coup on September 11, 1973. A flag of the Alliance Pais movement bearing the visage of Ecuadorian president Rafael Correa and Che Guevera’s famous saying “Hasta la victoria siempre” (forwards to victory) was also offered to the Longhouse. The gifts were graciously accepted, and the guests were invited to partake in a delicious meal prepared by the hosts. Once the gathering reconvened after lunch, further business was attended to. Recognizing the efforts of the Ecuadorian government in dealing with transnational corporations acting against the interests of indigenous peoples, the Oneida clan families asked for assistance from the Ecuadorians in understanding and addressing developments on their territory involving large corporations. In particular, the Oneidas asked for help with understanding corporate agreements made without their consent. The Ecuadorian delegation agreed to provide their international expertise in dealing with global corporations, and made a public commitment to follow up with a series of workshops on how transnational corporations operate, and how the Ecuadorian, Venezuelan, and Bolivian governments are working towards an alternative vision for their peoples. The Ecuadorians asked for a letter of support for their anti-Chevron campaign and the Oneida clan families agreed to write such a letter. The Oneidas in their turn asked for a letter of support from the Ecuadorians that would recognize the relationship that has been built together with the K^onthyokwanhasta over the past six months. The speaker from the Oneida families explained that the traditional clan families are not part of the elected band Council system and are not seeking provincial or federal recognition from the Canadian government. The clan families that make up the K^onthyokwanhasta are the basis of the Haudenosaunee Confederacy and they don’t speak for anyone else, only themselves. Traditional protocol was used to ensure that all parties had expressed what they had come to the meeting to say, and the meeting was concluded with a closing address and the taking of a group photo to commemorate the continued building of a relationship between the peoples of the land of the Condor and the peoples of the land of the Eagle. As in the other gatherings which have defined this newly emerging relationship, there was an air of happiness and very positive energy from all involved in the meeting. For more information about the work of the K^onthyokwanhasta, please contact Jagwadeh at 519-865-6407 or Anthony at 226-234-5342. For more information about the campaign against Chevron and the work being undertaken by Ecuadorian social movements in North America, please visit the website www.antichevron.ca or the Facebook group https://www.facebook.com/chevronsdirtyhand please contact Santiago Escobar at 647-920-6446.